Get a detailed quantity takeoff prepared by our professional estimators having over 15 years of experience. Reduce the work load on in house estimators. Get the ability to bid more projects in short time. 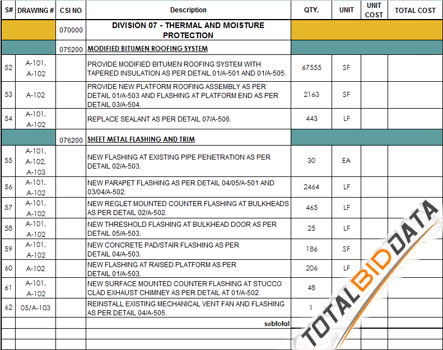 Compare in house estimate with TBD to eliminate errors and omissions. Get direct access to our estimators to explain the takeoff and answer your questions. Get the most powerful tool, get competitive edge. We are the only company in U.S. providing project leads with takeoff. No more loosing the bids because of overestimating. No more financial loss or reduction in profit because of underestimating. No more substantial bid spread if you are a low bidder. No need to lower the price to get the project, instead increase bidding and get the right project at right price. Quick bid or no bid decision by looking at our takeoff. See takeoff separated by each CSI division, get detailed scope of work for each division. Sub contractors can quickly pick up takeoff for their specific trade and provide quote to GCs. Material suppliers and distributors can quickly find the quantities of materials and allocate appropriate resources to market and sell their products. Instant access to plans, specs and addenda. Save thousands per year in plans cost, shipping, travel time etc. 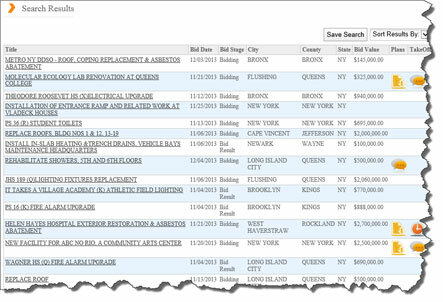 Quick bid or no bid decision by viewing plans online. Easy to view and download. 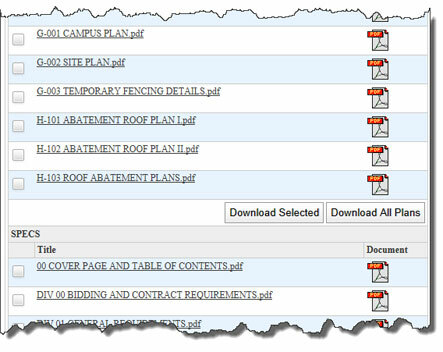 Download either specific plans and specs as per your trade or the whole project. Easy and quick distribution to subcontractors and suppliers and other members of project team. Easy to navigate through different sections. Get unlimited detailed, accurate, verified commercial construction project leads. Don't let opportunity slip through the cracks. Customize you search criteria according to you geographical area, scope of work, size of project, CSI division and find the projects which are relevant to you. No more wastage of time by looking through a long list of projects to find the right project. Detailed information about key contacts, Owner, Architect, Construction manager etc. with phone, fax, address and e mails. Get detailed plan holders list, know who you are competing with. Subcontractors and suppliers know who are GCs bidding. We are local in NYC and know the market and all possible sources of information. Our reporters physically go to source to dig down all the possible opportunities for you. Get direct access to our editors to answer your questions. We post bid results usually within 24 hrs to keep you up dated. Subcontractors and suppliers can offer their products and services to low bidders.